It's been almost 19 years since Princess Diana's tragic car accident in Paris. Millions mourned around the globe. The beloved "people's princess" — who was only 36 at the time of her death — would have turned 55 on July 1. "I don't go by a rule book, because I lead from the heart, not the head, and albeit that's got me into trouble in my work, I understand that," she said in 1995. "But someone's got to go out there and love people and show it." Here, we celebrate the rebellious royal for all the ways she flouted tradition. 1. She picked her own engagement ring — from a catalog. 2. She wrote her own vows. Unlike generations before her, she chose to abandon the royal wedding tradition of saying she would "obey" Prince Charles. Three decades later, William and Kate followed her lead! 3. She was a hands-on mom. The 20-year-old mom took a completely modern, intimate view of child-rearing from the very beginning. She chose her sons' first names herself and breastfed them as infants. (Charles wanted Arthur for their firstborn, Albert for the second.) And she didn't follow how Queen Elizabeth II handled Prince Charles' early years: When Charles was two, his mother flew to Malta to spend Christmas with his father, leaving him with his grandparents. "Diana and Charles bucked the royal trend of separation by taking nine-month-old William, as well as his nanny, with them on the six-week tour to Australia and New Zealand," royal expert Christopher Warwick said. "William and Harry were very, very fortunate with Diana as a mother because her ideas were so different to the previous generation." 4. She didn't work much. When she married Prince Charles, Diana gave up working as a nursery school teacher in favor of her royal obligations. But while she maintained her official duties, Diana worked to put parenting before her other commitments. "Inevitably, she left her children with nannies — just as she herself and so many other well-to-do British children have been left — but she tried to arrange her schedule to match the boys'," Katrine Ames wrote in Newsweek in 1997. "In her official calendar, the princess had all the everyday details of her son's utterly uneveryday lives marked in green ink." 5. She sent her boys to school. At his mother's insistence, William became the first heir to the throne to attend public school — at Jane Mynor's nursery school near Kensington Palace. "The decision to have William, 3, develop his finger-painting skills among commoners showed the influence of Diana, Princess of Wales, who had worked in a nursery school herself when she was just a Lady," George Hackett wrote in Newsweek in 1985. 6. She exposed her kids to a non-royal way of life. It wasn't just school where she rebelled against the constraints of royal childhood. Diana took the boys to get hamburgers at McDonald's, rode the tube and the bus, and let them wear jeans and baseball caps; they white-water rafted and rode bicycles. At Disney, they stood in line like everyone else. She also took them to hospitals and homeless shelters. "She very much wanted to get us to see the rawness of real life," William told ABC News' Katie Couric in 2012. "And I can't thank her enough for that, 'cause reality bites in a big way, and it was one of the biggest lessons I learned is, just how lucky and privileged so many of us are — particularly myself." 7. She understood the power of fashion. 8. She made bold style choices. For a 1985 appearance in Melbourne, Australia, the fashion icon accented her gown with an emerald-and-diamond choker — but she wore it as a tiara. We're pretty sure that wasn't quite how the Queen, who gave the necklace as a wedding gift, imagined the art deco treasure being displayed. 9. She talked frankly with the press. In 1995, Diana secretly gave a very revealing interview to the BBC's Martin Bashir. Though her aides claimed she later regretted it, the princess tried to take control of the media and paparazzi frenzy around her life. It was her first solo interview and was watched by more than 21.5 million people in the United Kingdom. 10. She got real about her marriage. In the BBC interview, she addressed Prince Charles's longtime relationship with Camilla Parker-Bowles: "A woman's instinct is a very good one; obviously I had knowledge of it from people who minded and cared about our marriage ... There were three of us in this marriage, so it was a bit crowded." The feisty princess also didn't deny her own eventual affair when Bashir asked her if she was unfaithful with James Hewitt: "Yes, I adored him. Yes, I was in love with him. But I was very let down." But airing the royal dirty laundry just wasn't done: Within a month of the interview, Diana's press secretary had resigned and the Queen sent the couple a letter urging them to divorce. 11. She spoke about mental illness and eating disorders. Princess Diana also told Bashir about her struggles with bulimia, which she said were a result of the stress she felt keeping her marriage publicly intact. "That's like a secret disease ... You inflict it upon yourself because your self-esteem is at a low ebb, and you don't think you're worthy or valuable ... It's a repetitive pattern which is very destructive to yourself." 12. She enjoyed the single life. When Diana spoke with children, she always crouched to see them at eye-level. It's become a signature move of her daughter-in-law. "Diana was the first member of the royal family to do this," said Ingrid Seward, editor of Majesty magazine. "The royal family used to say that everyone had to be deferential to them. But Diana said, 'If someone might be nervous of you or you're speaking to a very young child or a sick person, get yourself on their level.'" 14. She wasn't afraid to get her hands dirty. What Diana might be best remembered for is her compassion. (It's definitely been passed on to her sons!) 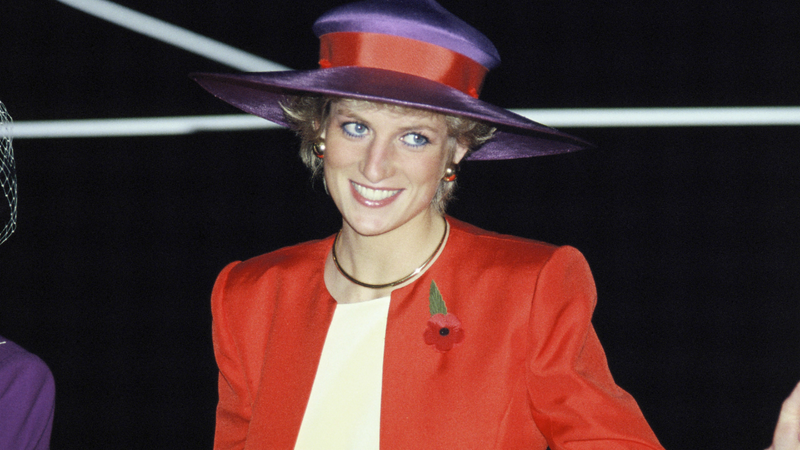 Like every royal, Diana supported various charities, but none took it so far. She famously walked across a partially cleared minefield in Angola to spread awareness of land mines. She shook hands with an HIV positive patient and visited Brazilian AIDS orphans in April 1987, when the disease was very misunderstood and stigmatized. "HIV does not make people dangerous to know," the princess said, "so you can shake their hands and give them a hug: Heaven knows they need it."